In a seed-free top half of the 2016 Mutua Madrid Open women’s draw, Dominika Cibulkova and Sorana Cirstea will battle it out for a lucrative spot in the semi-finals of a Premier Mandatory tournament. Cibulkova has been pushed to three sets in all three of her matches in Madrid this week; it’s been a challenging run but with all these wins, confidence is no doubt rising. Cibulkova missed a match point against Agnieszka Radwanska at Indian Wells, but in their first round Madrid clash, the Slovak played a superb third set to seal the win, 6-4 6-7(3) 6-3. In the second round, Cibulkova was skating on thin ice… down 0-6 0-3 40-40 against Caroline Garcia, she burst into life, with some help from her opponent, and sealed what had looked like an unlikely win at one point, 0-6 6-3 6-4. In the quarter-finals, Cibulkova came from a set down once more to defeat Anastasia Pavlyuchenkova, 2-6 6-3 7-5. Superior serving from Cibulkova was the difference with Pavlyuchenkova missing far too many returns. The Russian player was handed a lifeline when Cibulkova played a dicey service game when going for the match at *5-4. A passing shot into the net (after having successfully brought Pavluyuchenkova into the net with a drop shot) and then a double fault demonstrated Cibulkova’s nerves once more. However, Pavlyuchenkova played a poor service game in response and Cibulkova didn’t make the same mistake twice, booking her place in the quarters. I sound like a broken record but it’s so nice to see Sorana Cirstea back playing tennis and winning too! In fact, she’s been winning matches all year, 28 to be exact, although 15 of them have come on the ITF tour. Jumping back up to the WTA tour, Cirstea has made a smooth transition; she reached the semi-finals of the clay court tournament in Rio in February and in her last two WTA tournaments, qualified for the main draws in both Istanbul and Prague. 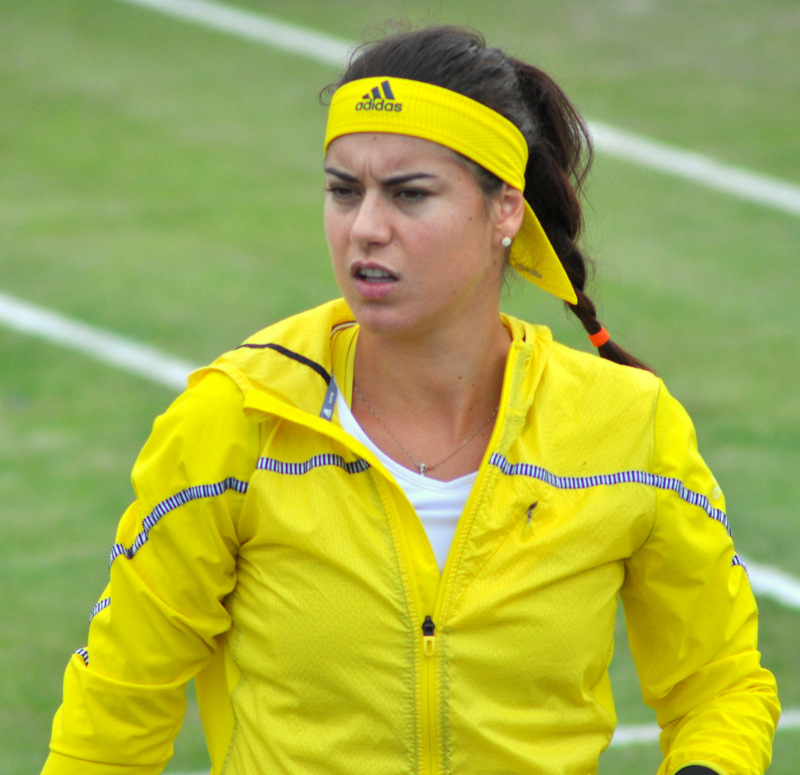 Cirstea opened her Madrid campaign with a fourth victory over a clearly undercooked, Jelena Jankovic. The Romanian player backed it up with a decent second round win over recent Istanbul finalist, Danka Kovinic, 6-3 7-5. While Cirstea failed to serve out both sets, she was hitting the ball beautifully. There’s a crispness to her strokes that is compelling to watch. In the third round, she bagged a brilliant victory over the in-form, Laura Siegemund, 6-4 7-6(9). In the second set, Cirstea missed four break points for a double break, 4-0 lead. Siegemund held and then followed it up with three more games to go up a break. Cirstea refocused to get back on level terms and produced two solid service games at 4-4 and 5-5. The pair played out an enthralling tiebreak with set points and match points constantly being exchanged. Cirstea saved a set point at 5-6 with a bullet cross-court forehand that took Siegemund by surprise. In the end, Cirstea saved three set points to tough out the match in straight sets. Siegemund came back into contention during the second set with her backhand down-the-line peaking but on the whole, Cirstea was the more consistent player. Unforced errors from Siegemund at the end characterised her performance… she’s had a great run but looks in need of a break! Cirstea handles Siegemund's variety well. Laura looks flat & hits too many errors under pressure. Sori wins, 64 76(9). Cirstea has won more matches in the first five months of 2016 than she did in 2014 and 2015 combined! Final thoughts: I’ve been really impressed with Cirstea this week and she has looked more tactically astute than when she was last playing regularly on the WTA tour. She hasn’t been convincing in serving out sets but really held her nerve in the second set tiebreak against Siegemund. Cirstea’s newly abbreviated serve, due to the continued shoulder problems, has generally been holding up well this week. You always know what you’re going to get with Cibulkova; she’s a punchy competitor and hits big and deep. Cibulkova’s nerves have been evident in the key moments this week (and throughout the whole year). In this match-up, she might feel some pressure as the favourite. However the three wins this week, as well as a recent title in Katowice, should give her the confidence to fall back on that her best tennis is clicking into place. While i’ll personally be cheering for Cirstea, I think that Cibulkova will ultimately prevail. May 4, 2016 in Cibulkova, Cirstea, Madrid, WTA. I would love to say that Sorana will take this one but Dominika plays same psychological war at the court and to me it is too much but it is working very well. Also she will have to keep serving very well through the whole match because in case Sorana will return as she did last matches, Domi will have no chance to overpower her when serving second serve. I say Sorana will take the first set a then we will see, but it is really hard to see Domi loosing this one as you say James a it might easilly under 17 games match.. Looking forward. Although I thing Tig will be different, if she can stay at her level of defence, she will surprise again. Good call on Cirstea-Cibulkova! I thought Tig might keep her run going, but Stosur played much better tonight.